This evening the oldest cultural institution in Latin America will present an extravagant program, which includes solo guitarist Flavio Sala in the guitar and orchestral concert performance Aranjuéz by composer Joaquín Rodrigo, as well as a selection of other continental and universal works. The VSO captured the audience in the Sauto Theatre, Matanzas, with the Oboe and Orchestra concert by creator Benedetto Marcello, as well as the technical and skilled solo performance by the talented oboist Jorge Alcarra. 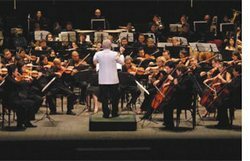 The New World Symphony earned the approval of the considerable audience in attendance at the National Monument Coliseum in Matanzas as did the famous work Alma Llanera, part of the Venezuelan folklore and Cuban Fantasy with musical arrangements by Sergio Elguin. This is the VSO’s first international tour this year and according to its director, Angelo Pagliuca, they will return to Cuba in the near future. Jorge Luis Pacheco, director of the renowned Caracas theatre, Teresa Carreño, attended the concert in Matanzas and expressed his satisfaction and pride upon participating in this hundred year old institution and mentioned his intention to commence new projects.